Dr. Michaels’ dream has always been to have a dental office that offers quality dental treatment with warm and inviting surroundings, where his patients know they receive the highest quality care. That’s what he is proud to offer Atlanta patients! 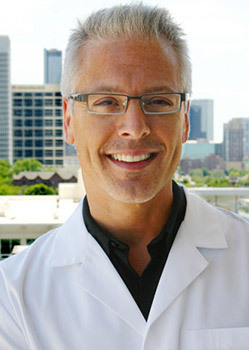 Dr. George Michaels is a life long native of Atlanta and has been practicing dentistry in the area since 1987. He attended the Georgia Institute of Technology from 1977-1981. He graduated top of his class from Emory University School of Dentistry in 1987. Dr. Michaels practices every facet of dentistry, specializing in cosmetic/aesthetic dentistry, and has enjoyed working for the past 20 years with the community and helping in the Ben Massell Dental Clinic for those who are less fortunate. Dr. Michaels enjoys the pursuit of knowledge; he frequently attends the Peachtree Summit Study Club headed by Emory alumni professors to keep up with the latest technology and advances in dentistry. He also attends annual seminars at the Hinman Convention under the supervision of respected professors and clinicians from around the country. He is a member in good standing with the Georgia Dental Association and the American Dental Association. Dr. Michaels is an inductee into the Honorary Dental Society of Omicron Kappa Upsilon. When he is not in the office, you can find him working out in the gym, skiing, or bicycling, and spending time with his dog, Oliver. Dr. Michaels has a creative side and enjoys painting. He has an excellent eye for design, as shown in his newly renovated dental office. He may even be found many days working on home improvements projects.